Comebacks come as the highlight of K-pop fandom life. They offer a chance to see our favorite idols in a new light, on television, and most importantly, we finally get new music. However, with a constant deluge of comebacks, it can be hard for a group or artist to stand out from the pack. For this Seoulbeats Mid-year Review roundtable, Kabejja, Caterina, and Chelsea came together to discuss the comebacks that left a lasting impression in the first half of 2018. While a lot of new faces made our lists, and made a name for themselves this year, a handful of veteran groups also continued to impress. After reading through the panel’s picks, be sure to leave your favorite comebacks in the comments down below. Kabejja: Looking at everyone’s lists, we have completely different choices for this roundtable. Apart from Momoland, our lists are dissimilar as there have been a great number of K-pop acts having either gained mainstream or international recognition or made a comeback. Each of us has one K-pop act that has made an anticipated return. Amongst the many long-awaited comebacks this year, it looks like two of them feature on your lists — BTS and Shinee. For me, it’s Yoon Mirae. Since the announcement of a new album, I have been waiting excitedly. This year, we have had two tracks from her, “No Gravity” and “Kawi Bawi Bo“. “No Gravity” is reminiscent of her old songs with its mix of ballad and rap powered by her strong, soulful vocals. I loved the song’s raw emotion both from her voice and the lyrics. “No Gravity” feels like a song that has come from Yoon Mirae’s heart. “Kawi Bawi Bo” is a powerful and defiant showcase of strength from her. It had everything that I wanted from her — fierce rapping, the uplifting energy, the MFBTY style catchy hook, the perfectly matching dance routine. Caterina: Yes, our lists are completely different, which is a pretty interesting thing. I’ll kick it off with the only shared point in our lists: Momoland. “Bboom Bboom” is a turning point in their career. It’s likely to become their signature song, and it has helped them gain recognition as a group. I can’t help picturing JooE‘s blonde pigtails when I think about “Bboom Bboom”. Maybe it’s because of her public image, but I really think this fun and energetic concept suits the girls very well. The song is catchy and the totally unpredictable trap moment made it even more fun. On top of that, the “Bboom Bboom” dance is easy to remember, and I’m not surprised it kind of went viral. While my list and Kabejja’s are dominated by female artists, Chelsea’s leans more towards boy groups. Can you tell us your reasoning behind it? Chelsea: For this year’s list, I wanted to focus on groups who really came into their own in 2018. 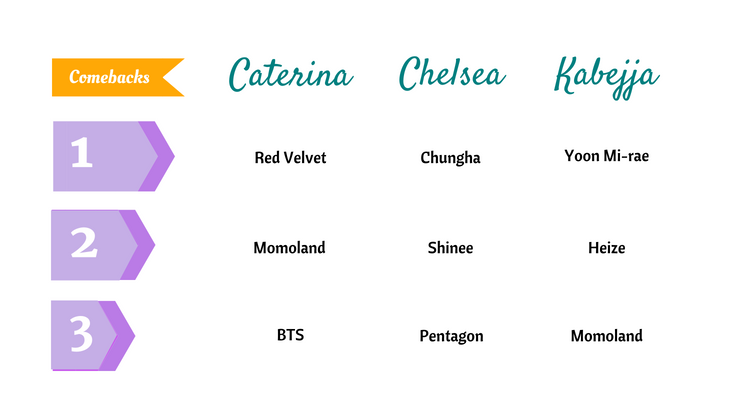 I debated between Momoland and Pentagon for my third spot, so it’s great that Momoland was represented on both of your lists. “Boom Boom” definitely had an impact and helped to make Momoland known. Kabejja: The reason is that I put Momoland on my list is that “Bboom Bboom” is something that I have missed: a brilliant, shamelessly silly, fun and hook-laden track. The song does what the best catchy, cute-concept girl group songs do — it sticks in your head and it is pure joy. It was just really great to see another brilliant example of this distinctly K-pop sub-genre this year for me. Chelsea: The same can be said for Pentagon who ultimately took third place on my list. While their releases have never been sub-par, they’ve also somewhat been overshadowed by other boy groups promoting at the same time. However with “Shine” they also embraced a more quirky concept, and it really worked to their advantage. 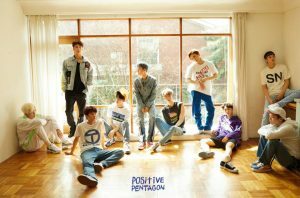 Moving from 2016’s “Can You Feel” to “Critical Beauty,” and then to this year’s “Shine,” it’s clear that they’re shifting away from what is trendy for boy groups and instead focusing on concepts that are uniquely Pentagon. They’ve found a good direction to move forward with: fun, catchy, and more playful than previous releases. I can say this is the first Pentagon release I’ve recognized in coffee shops or convenience stores, which means it’s succeeded in getting the public’s attention. However, I totally agree with both of you that so far 2018 has been a stand-out year for female artists, especially soloists like Yoon Mirae, Heize, and Chungha. “Mianhae” reminded me of a caption on Knowing Bros which joked that after every small mistake they have made, idols almost automatically publish a reflection statement. “Mianhae” takes on the joke and expands on it with cleverly conceived social commentary in both its lyrics and the MV. The song features Heize repeatedly saying “mianhae” like a robot for a range of “mistakes” from being sick to being human and existing. The MV compliments this well with visually stunning images of Heize as a humanoid. It powerfully shows Heize taking back control of her artistic identity as the song shows her awareness of the fact that she cannot please everyone. For me, this song is her best work yet, reflective and very smart. 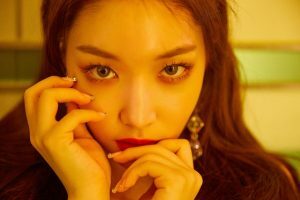 Chelsea: While there have been a lot of strong female solo comebacks this year, Chungha’s January release of “Roller Coaster” has by far stood out the most for me. Debuting as a soloist post-I.O.I. was absolutely the best decision for Chungha. No one denied that she had all the talents to be a soloist, but company management also plays a huge role. In that regard, Chungha lucked out. M&H Entertainment have taken great care in finding concepts and songs that fit her. This was no better proven than with “Roller Coaster.” The track not only got a ton of public attention — and proved its endurance in terms of charting — but it also had a top-notch MV and choreography that bring out Chungha’s charms. Lo was completely correct in titling her the “new queen bee” following the release of Offset, and my hopes are high for her comeback next month. Caterina: I was also incredibly impressed by Red Velvet’s “Bad Boy.” It’s not the first time that the girls go for R&B slow tempo songs, but their sensuality in “Bad Boy” really blew me away. They aced the girl crush concept, and I really hope we’ll get to see more of this from them. The music video had a really modern aesthetic to it, and everybody knows how much I am into that. I really wonder if any other artist this year will be able to dethrone “Bad Boy” from its number one spot in my heart! Chelsea: While female soloists do dominate our overall lists, it’s also been a great year so far for boy groups, especially BTS. Caterina, what put them on your list? Caterina: This is my 10th year into K-pop and as time went by, my standards definitely got higher. There aren’t many comebacks that still manage to blow me away, but BTS made it. I’ve started getting into them only recently: I thought that if the whole world was going crazy about them, then I was definitely missing out on a great group. There’s nothing about “Fake Love” I would change. I was really impressed by the song’s production and by the music video. It’s definitely one of my favourite comebacks of theirs. 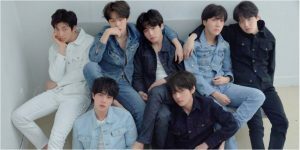 Chelsea: ​With “Fake Love” and Love Yourself: Tear, BTS expanded on both their artistry and concept development. The reaction to the comeback was huge and it definitely deserves a place on our lists this year. Considering this is only the second installment of the series, there’s even more room to grow with the next comeback. Kabejja: Chelsea, what are the reasons behind having Shinee on your list? Chelsea: While there is the obvious significance of Shinee’s first comeback as four, they came in second on my list because of how they went about their comeback. By choosing a three-part series instead of one big release, they gave themselves and fans a narrative space to work through all the mix of emotions that come from this being their return without Jonghyun. In “Good Evening” we watch them drown in loss, “I Want You” focused on escaping through fantasy, and finally “Our Page” — the most impactful of the three — commits to the memory of Jonghyun as well as the group’s promise to continue their story. I think that Shinee needed this process as much as the fans did, and the implications of the media circus in the MVs speak to their struggles. Beyond just the content of the music videos, there’s also the quality of the three mini albums: each expand on Shinee’s sound, yet contrast one another in terms of soundscape and content. Together, they form a cohesive whole, and another impressive release for the group. I have nothing but gratitude and admiration for Shinee and SM for the way they dealt with this comeback: it’s first and foremost about the four members, but it doesn’t leave out the memory of Jonghyun either. The final track of the trilogy, “Lock You Down,” is the only track with all five members, and while it breaks my heart a little bit, it’s an incredibly healing release. Caterina: I enjoyed Shinee’s comeback as well. Shinee have always been experimenting with their sound and just like Chelsea said, dividing the album in three parts gave them the chance to showcase a broader spectrum of what they’re capable of. On top of that, their tribute to Jonghyun was really tasteful and sweet. I wish them all the best in the years to come. I think so far 2018 has been quite a packed year in terms of comebacks. This is probably the reason behind our lists’ diversity. The second half of the year will probably be just as rich, if not even more. Several senior groups are preparing for summer comebacks and even groups that already had a comeback this year are likely to have another one. There’s still a lot to look forward to before 2018 wraps up. Readers, which comebacks stood out for you in the first half of 2018?